I'm starting to like this "goof-off" sewing period in my life. I think this may be a new tradition that I will like to put into action: for a few days (weeks?) after the Christmas hub-bub, I allow myself to sew whatever I want to sew without feeling guilty about The List. I feel like I felt the first few weeks after I retired - "OMG! I can do whatever I want!" That freedom does not last long, as most all retirees will tell you. Life happens as it does when you're working, and before long, days are filled with a list of to-dos. Okay, back to the quilt. I had a layer cake of 40 squares of flannel from the Maywood Woolies collection. 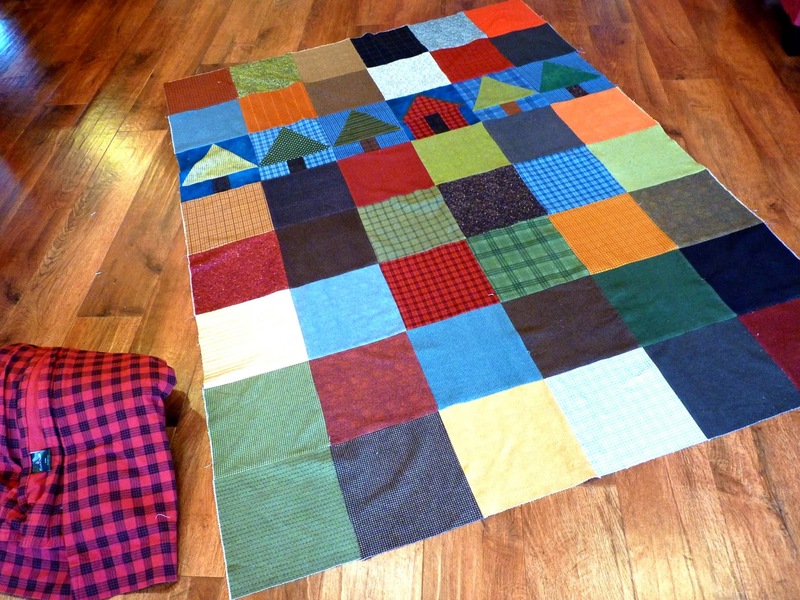 This is a collection of flannels that are printed to look like wools. Much prettier in person than in this bad photo. I was tempted just to sew them together without preshrinking, but then thought better. In the past, some of my flannel projects, and some flannel projects of friends, have pulled away from seams. I had always thought it was either that the flannel was not densely woven, or, the seam allowance was too small. Layer cakes are 10" squares, factory cut. I decided to brave the dryer lint and prewash all 40 squares. The lint wasn't as bad as you would think. Plus, once dry, the squares measure 9.5"! That 1/2" is quite significant, and must be the cause of flannel pulling away from seams once a quilt is washed. One thing I didn't do is measure all 40 squares before sewing them together. I think some of the squares shrunk one way more than the other, because sewing them together, I had some corners that didn't meet up so well. (Maybe my sewing skills?) I also decided that I wanted this quilt a bit longer than 6 blocks by 7 blocks (I added two more flannel squares from my stash). So, I added in the tree and house row, blocks that are 9.5" x 10.5", unfinished. That added an additional 10" to the overall length, making it a quilt topper for a twin bed or for my mom's nursing home bed. You can see the red plaid flannel flat sheet by the side. I decided to use part of that for the quilt back. I think I might see if Kohls still has some of those sheets left because I am finding they are coming in quite handy! Not sure how I am going to quilt this yet. It needs something not too dense to keep the cuddle factor going. Jerilynn P.S. The house block is red with a green roof...just like our house! Oops! I just upped it by one by logging off and going back to it. Tee-hee!